You thought that connecting TagMyDoc with Dropbox and Box was great? Well, it got awesome. 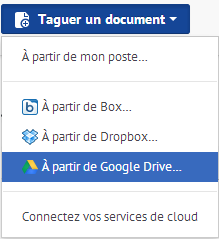 We pushed a little further so you can now connect your TagMyDoc account to Google Drive as well. Starting today, you can directly access your Google Drive documents from TagMyDoc’s platform when tagging a document, whether it be a document, presentation, spreadsheet or any template. Native Google Docs documents will automatically be converted to a PDF before tagging. Once done, you will have two versions saved: one in your TagMyDoc account, the other on Google Drive with the “tagged” appended to its name. Here’s how to connect your account. First, login into your account. Then, simply head to your connections settings. Or, when you want to tag a document, clicking “Connect more accounts” will direct you to it. Don’t wait to try it out. Tagging documents gets easier, day after day!